Kicking things off in our 31 Days of Android series, we’ll talk about getting things set up for development. When you want to start developing for Android, you have a decision to make. You can use the Eclipse development environment which has integration with Android Development Tools or you can use the command line to create, compile, and package your Android apps. If you’re set on the IDE you want to use, and it isn’t Eclipse, you can do it, it’s just not as easy. For today we’ll just assume you’re going to use Eclipse. When you go to download Eclipse, you’ll want to choose Eclipse IDE for Java Developers. The current version of Eclipse is 3.7.1 and is code named Indigo. If you already have an older version of Eclipse installed and it’s relatively recent, you can probably get away with using it. However, I have run into issues with one of the more advanced features not really working in older versions of Eclipse, so unless you’re set on staying with an older version, grab Indigo. Once you’ve pulled down Indigo (or opened your older version of Eclipse), it’s time to install the Android plugin for Eclipse. If you only want to develop for the latest version of Android (4.0 / Ice Cream Sandwich at the time I wrote this), you don’t need to check the second box. However, if you want to support the majority of devices, make sure you check the 2.1 box as well. 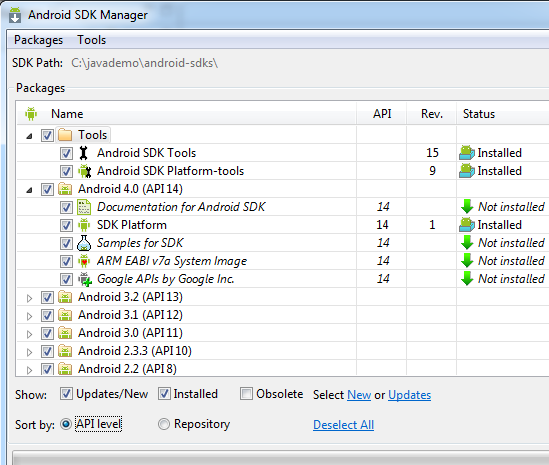 After proceeding, you’ll need to Accept some terms and install the SDK. If nothing else, make sure you have installed the Android 2.2 (API 8) folder. There is some functionality we’ll play with later in the series that requires at least version 8 of the Google APIs. If you choose to install everything, it’s going to take a little while. That’s it for today. You’re just about ready to get started with developing for Android. Next, we’ll look at creating Android Virtual Devices. You can read more about the install process here (just a warning, as of when this was written, some steps weren’t updated for v15 of the ADT). referencing this right now for something I'm testing for android! Someone may want to do a write-up on problems installing the Eclipse IDE. I had a problem getting it to recognize the Java JRE file (part of the JDK). I'm not even sure how I got it fixed. I had trouble finding any help with my troubled installation. Can i know what is the error and when you are getting.